Everyone who is keen on skiing and interested in news about resorts, looking forward to starting a new season, might know that this year the newest ski area in Switzerland construction has gone to its finish. It is about the creation of merging Andermatt and Sedrun ski areas – Andermat-Sedrun SkiArena with more than 120 km of pistes and 25 lift systems. 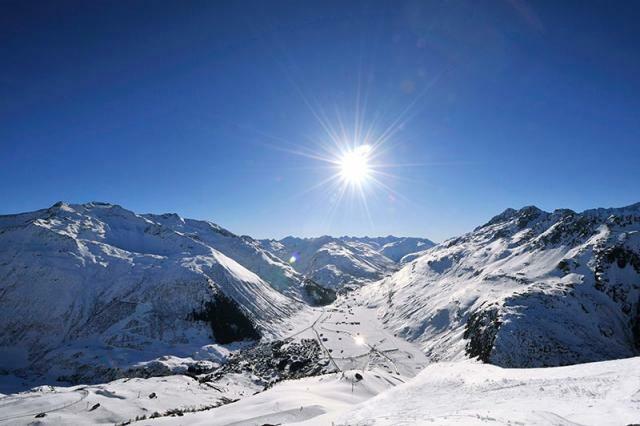 The main resort of this ski area – Andermatt will be loved by freeride lovers, giving preference unmarked pistes. This small ski village is located not far from Zurich airport in Uri canton, almost in the heart of Switzerland. That’s why you don’t need to spend time for transfer (although train trip in Switzerland is amazing!). In anticipation of a new ski season we’d like to get acquainted with Andermatt and let you know about this wonderful place, which, definitely, will be a popular venue for skiers, freeriders and just for those who loves quality services! We contacted to Markus Berger, the Head of Communications of Andermatt Swiss Alps, and he gave us the answers for the most interesting questions about Andermatt resort. Let’s get acquainted with it! – Could you tell a little about the location and history of the resort, its sights and natural peculiarities? «Of all the places I know, it’s the dearest and most interesting», said Johann Wolfgang von Goethe about Andermatt, which he visited repeatedly to recuperate in the healthy mountain air. Andermatt, with its grand hotel, has been known for over 100 years as one of Switzerland’s most popular holiday and spa destinations in summer and winter. It is situated at the crossroads between north and south, and between east and west of Switzerland, and due to its central location it is connected to the greater region by three Alpine passes: Oberalp Pass to the east, Gotthard Pass to the south and Furka Pass to the west. The Gotthard Pass is known worldwide. When it was built, the route greatly enhanced prosperity in Andermatt, giving residents and visitors easy access to the village. In the 12th century the nearby SchÖllenen Gorge was conquered with the construction of «Devil’s Bridge», shrouded in myths, and this link has enhanced trade ever since. Traders from the region and beyond benefitted from this route. The railway tunnel constructed in 1882 quickly became one of the most important trans-Alpine routes. Until the new millennium, Andermatt served as a base for the Swiss Army. Since the army has drastically scaled back operations, Andermatt is gradually becoming an increasingly popular holiday destination again, with charming hotels and fine restaurants. The locals are friendly and the landscape is picturesque, so visitors get the impression that this is a hidden gem of the Alps waiting to be re-discovered. – We knew the major infrastructure changes are expected in Andermatt the next few years. And a construction of new ski lift has been started recently. Tell us, please, more about your ambitious plans. How is the resort going to change in the next 5-10 years? The roadways over and through the Gotthard remain amongst the most important transalpine routes to this day, and they ensure the excellent accessibility to Andermatt. It’s going to be fitted with 25 lift systems, snowmaking equipment, luxurious and wonderful accommodations with a mix of traditional architecture. – Who was involved in such a scale modernization? Andermatt Swiss Alps, in collaboration with a team of over 30 renowned architects from around the world – selected in an international design competition – is providing a blend of modern and traditional architecture. The architecture firms have been directed to inform their architectural designs with Andermatt’s magnificent alpine context and provide a setting that will please both owners and hotel guests all year round. – Markus, it is known that any construction in the Swiss Alps relates to the complex and lengthy negotiations with cantons’ government, local authorities and environmentalists. For example, Arosa and Lenzerheide have gone to do a merge of ski areas for several decades. Have you reached the agreements with everybody? Getting the permits was a process of almost five years. First within two years was the planning with all the government offices, then one year negotiations with the environmental NGOs, then almost two years for the specific construction permits. Now all permits are obtained. – The press reported that the legendary Swiss skier Bernhard Russi is going to design new ski routes at Ski Arena. What routes (runs) and how soon will they be in Andermatt-Sedrun ski area? Bernhard is working as a consultant, ambassador and board member, but he’s not designing slopes. One slope of our highest mountain (Gemsstock) is called «Bernhard Russi Run», because it’s the most dangerous and steep downhill slope, which he loves very much. – Is it true, that with the formation of a general ski area with the neighboring resort Arosa, Lenzerheide opened a new page in its’ history and the resort became more competitive? How long did it take to conduct a merger and what are the peculiarities of skiing at the resort now? Unlike Arosa&Lenzerheide, the two resorts of Andermatt and Sedrun are historically linked and working together. Today the Glacier Express (train) connects the two resorts (20 minutes train ride) for the skiers, in two year’s time, skiers will be able to ski from one resort to the other (and take the chairlifts back). – Are there general or off-piste skiing areas? One of Europe’s finest off-piste-skiing mountains is Gemsstock. Freeriders from all of Europe and North America regularly come to ski here. – Are there facilities for snowboarders? Yes, both Andermatt and Sedrun do have extensive «fun parks» for snowboarders. – What can you say about accommodation facilities at the resort? We heard about the intense activity of Egyptian entrepreneur Samih Sawiris, the owner of fabulous hotel «Chedi». What’s new is expected in the coming years? 5-star-deluxe The Chedi Andermatt is top level in the resort (104 rooms, from 54 square meters up), many 1 to 3 star hotels, several lodges, two boutique hotels was already here, a new 4-star hotel (180 rooms) is being built (opening in 2018), more to follow. – Besides the previously mentioned hotel «Chedi» could you tell us the most popular and famous places for tourist accommodation? Basically, the resort offers accommodation in hotels. Or residences and chalets are more popular among your guests? It’s about half-half: 50 % of the guests are staying in hotels, 50 % in holiday-apartments, very few in chalets.Among the most popular there are Hotel 4B, Gotthard Residences, apartment housesBiber, Hirsch, Steinadler, Gemse, Schneeflakeetc. – What basic skills and new trends can your ski schools teach children and adults in the daytime on slopes? Everything needed, from group lessons for beginners to exclusive one-on-one teaching and guiding. – What does the resort offer for young people? Music festival, aprÈs-ski, nice bars and clubs. – What does the resort offer for families? – What does the resort offer as aprÈs-ski? Except aforementioned, one of the historic stately homes in the village centre today houses the Talmuseum (Valley Museum), which depicts and describes the culture and history of the village. Andermatt also has fine restaurants offering local and authentic Swiss specialities as well as international cuisine. Most of the restaurants and bars are found along the main street. Visitors often find that the simplest kitchens and restaurants seem to cook the best food. The local cuisine features French, German and Italian influences yet stays true to its Swiss roots. Besides, there will be some golf-courses. – How long does the ski season last? It is going to start on November 14th. And its’ end is in the end of April. – Is the weather stable? Very stable and very snow-secure, guaranteed to have snow due to its central location in the Alps. – What is the size of snow cover? – From which countries do your tourists usually come from? Switzerland, Germany, Italy, Netherlands, Scandinavia, US. – What are the best means of transportation to reach the resort from main airports and railway stations? From Zurich airport Andermatt can be reached easily by (rental) car within 90 minutes, or within 2 hours by train. Some hotels also offer pick-up-service.